During the 1990s trade unions in Australia were involved in an unprecedented amount of mergers that resulted in a significant reduction in the number of unions. Most of this merger activity consisted of either amalgamations or absorptions, and has been subjected to considerable research scrutiny. The merger of five separate police unions created the Police Federation of Australia. However, the Federation is unique among the union mergers in this period because it evolved from a federally registered police union, the Australian Federal Police Association, altering its rules to grant it coverage of all police in Australia. This paper examines the formation of the Federation, and suggests that both the form of the merger and the merger process are not easily explained by the existing literature. 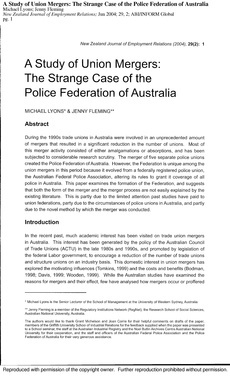 This is partly due to the limited attention past studies have paid to union federations, party due to the circumstances of police unions in Australia, and partly due to the novel method by which the merger was conducted.